We recommend checking out our discussion threads on the Styrka 10x42 S7-Series Binocular ST-35522, which address similar problems with connecting and setting up Binoculars Styrka. The user manual for the Styrka 10x42 S7-Series Binocular ST-35522 provides necessary instructions for the proper use of the product Optics - Binoculars - Binoculars. Styrka designed their 10x42 S7-Series Binocular as an instrument that combines optical performance with rugged construction to give hunters a valuable advantage in all weather and lighting conditions. Styrka employs multiple technologies to produce crisp and clear images with accurate color representation. First, they use extra-low dispersion (ED) glass elements and phase-corrected BAK4 roof prisms. This combination corrects for chromatic aberration for rich and true color rendition. To increase light transmission, and enhance image brightness and contrast, are fully multicoated optics using the proprietary SXL-MAX anti-reflection coatings and dielectric prism coatings. The optical coatings are engineered to maximize light transmission across the entire visible spectrum which further increases the color accuracy, while the prism coatings reduce light loss through them to virtually zero. 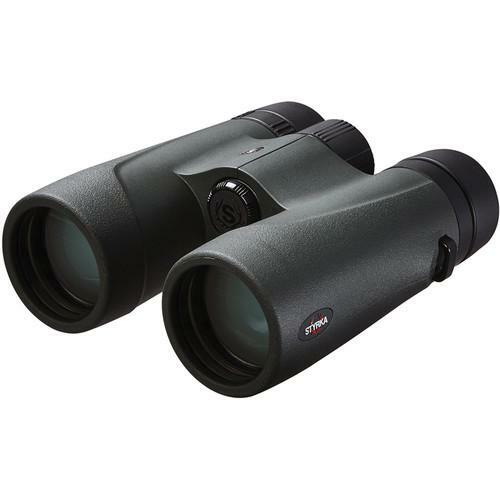 While its field of view is decreased versus lower power instruments, its 10x magnification gives users the ability to spot game at further distances and pick them out in heavy brush. Larger 42mm objectives gather more light than smaller objectives without making them too large and cumbersome to carry all-day with a full pack of gear. If you own a Styrka binoculars and have a user manual in electronic form, you can upload it to this website using the link on the right side of the screen. Interpupillary Adjustment 58 - 72 mm / 2.28 - 2.83"
Box Dimensions (LxWxH) 8.5 x 7.8 x 3.9"
The user manual for the Styrka 10x42 S7-Series Binocular ST-35522 can be downloaded in .pdf format if it did not come with your new binoculars, although the seller is required to supply one. It is also quite common that customers throw out the user manual with the box, or put the CD away somewhere and then can’t find it. That’s why we and other Styrka users keep a unique electronic library for Styrka binocularss, where you can use our link to download the user manual for the Styrka 10x42 S7-Series Binocular ST-35522. The user manual lists all of the functions of the Styrka 10x42 S7-Series Binocular ST-35522, all the basic and advanced features and tells you how to use the binoculars. The manual also provides troubleshooting for common problems. Even greater detail is provided by the service manual, which is not typically shipped with the product, but which can often be downloaded from Styrka service. If you want to help expand our database, you can upload a link to this website to download a user manual or service manual, ideally in .pdf format. These pages are created by you – users of the Styrka 10x42 S7-Series Binocular ST-35522. User manuals are also available on the Styrka website under Optics - Binoculars - Binoculars.